Turn beautiful Butterfly Ornaments into wonderful bracelets! Learning Objectives: Use a unique material to create a color resist effect. Learn to diffuse colors with special paper. Create swirly designs, shapes and interesting patterns on the wings. 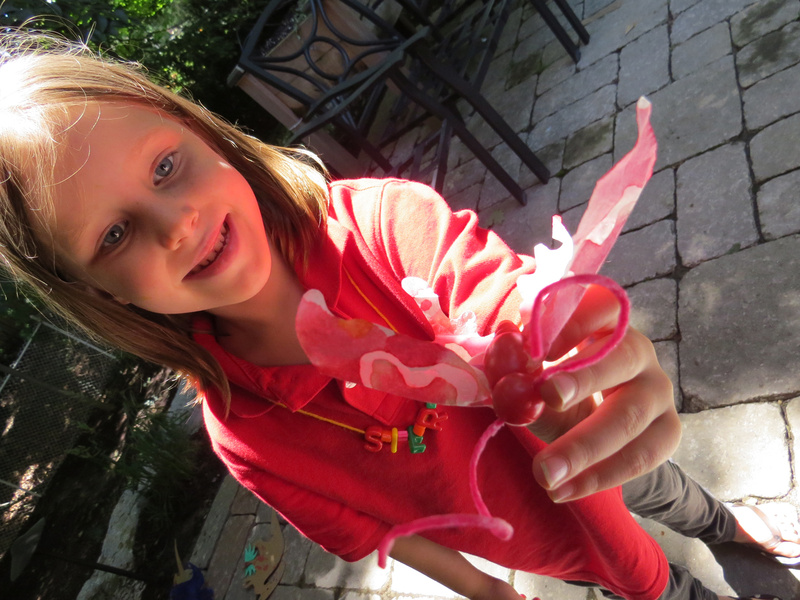 Use fine motor skills to squeeze wing designs into bug bodies and curl antennae. The Butterfly Ornaments Kit features pre-cut butterfly wings made out of Color Diffusing Paper. 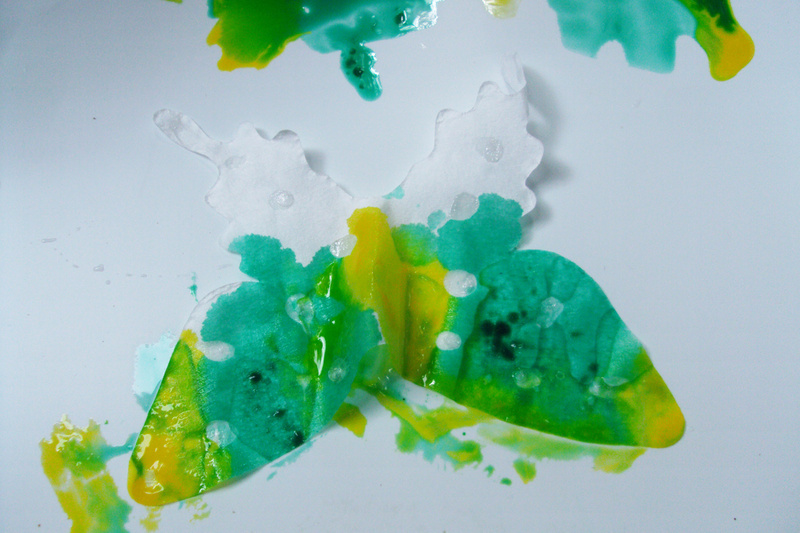 It’s a good idea to put the wings onto a paint tray as you drip-drop the color resist glue. 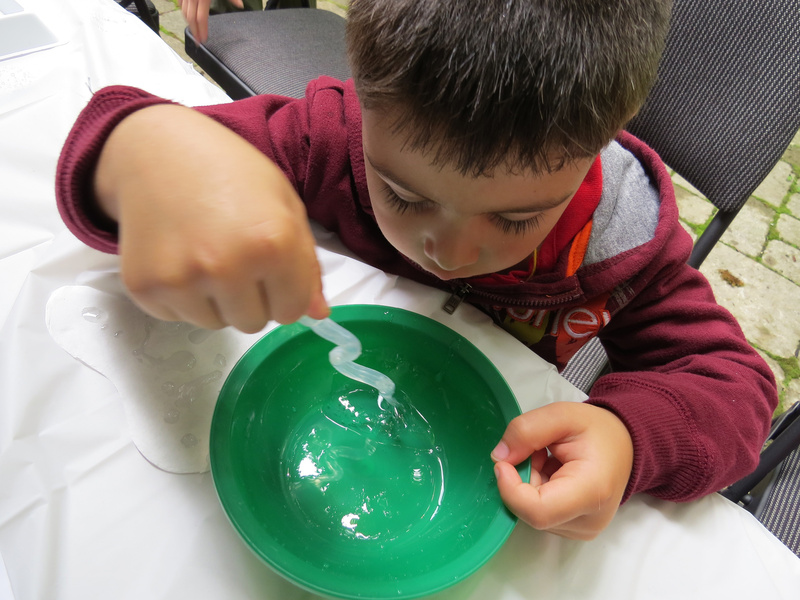 Pour some clear glue into a plastic bowl. Squeeze the bulb of a Squiggle Pipette to expel all the air from it, then drop the tip into the clear glue and release. This will draw in some of the clear glue into the pipette chamber. Press the pipette bulb to squeeze out the glue onto the Color Diffusing Paper butterfly wing. You can draw shapes such as stars or circles, or make patterns like polka dots! 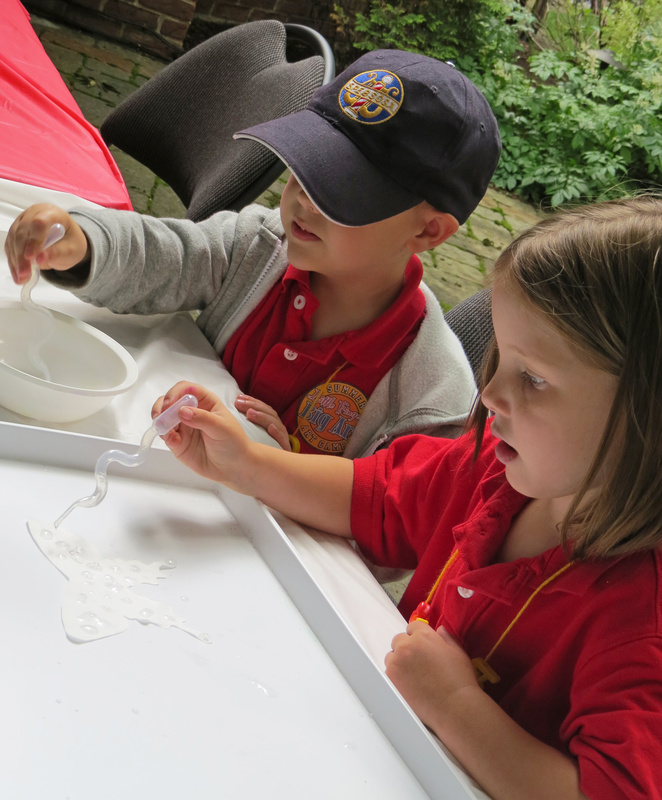 This art camper decided to make polka dots out of the clear glue. Leave the glue to dry overnight. 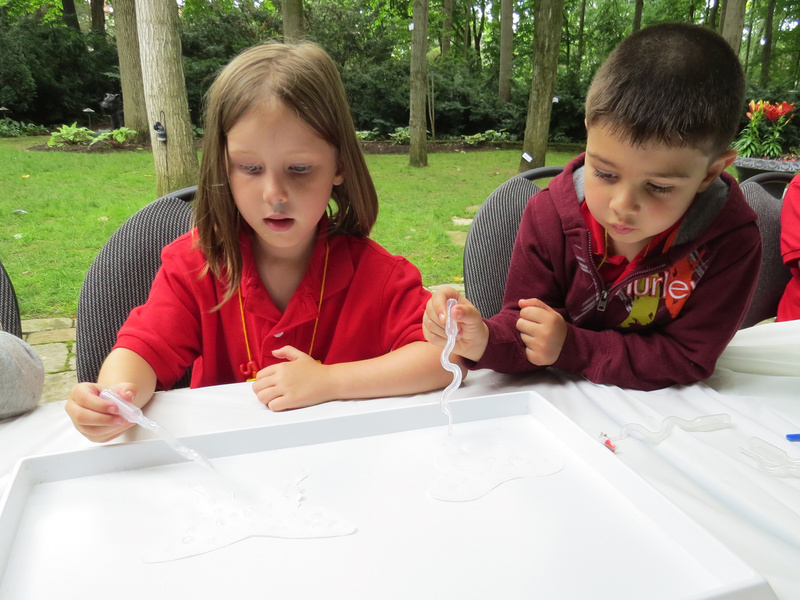 Once the clear glue has completely dried, use the Squiggle Pipettes to drop watercolor paint on top. As you can see in the above image, all the areas where the clear glue had dried will repel the paint. Once the wings are dry, you can accordion fold the wings and squeeze them into the slot of a bug body. The bug bodies are included in the kit. You can insert a pipe cleaner through the head and wrap the length around your wrist. This will make a bracelet! Alternatively, you can string the colorful wax-dipped antennae through the holes in the head of the bug body. 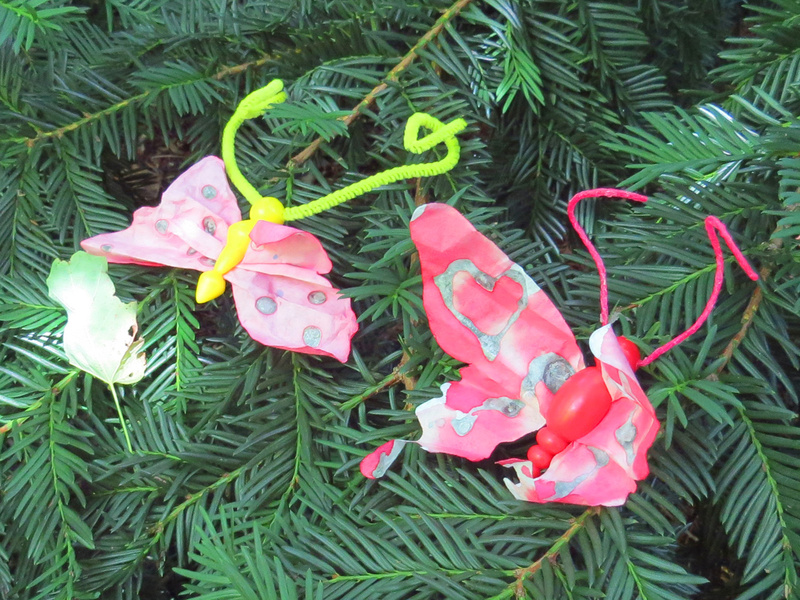 Our art campers placed their butterfly ornaments onto the greenery in the area. As the watercolor dries, it leaves a beautiful color on the wings! This entry was posted in Crafts, New and tagged bracelet crafts, butterfly bracelet, butterfly crafts, butterfly ornaments, butterfly wings, clear glue, color resist, kids crafts, nature crafts, pipette glue, squiggle pipettes by roylcoblog. Bookmark the permalink. So cute! I love this craft! 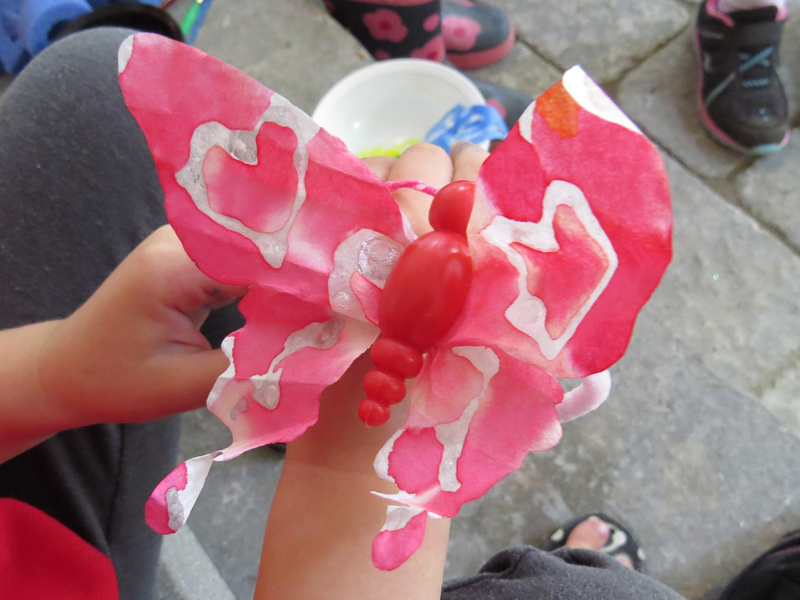 What a pretty butterfly craft! 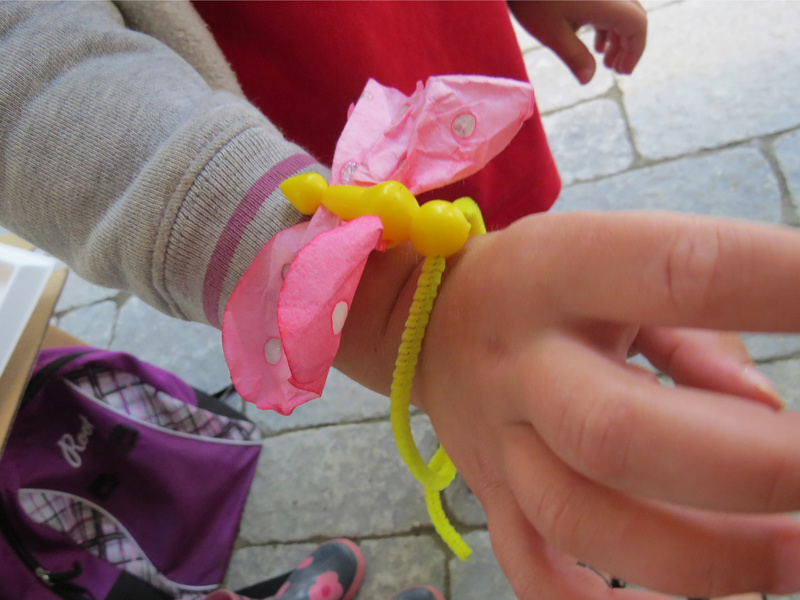 Beautiful Butterfly Ornament Bracelets from Little Fingers Big Art. You can pick up your Butterfly Ornaments Craft Kit here: http://www.qualityclassrooms.com/butterfly-ornaments-craft-kit.html.